ww2dbaseEdmund Veesenmayer was born in Bad Kissingen in southern Germany. At the age of 21, he joined the Nazi Party, and by 1932 had established himself as an influential member of the party. In 1941, he was a member of the German diplomatic staff in Zagreb, Croatia, Yugoslavia, where he played a role in the persecution of Yugoslavian Jews. 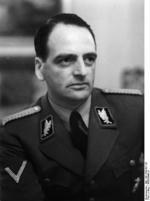 In Mar 1944, he was assigned to the German embassy in Budapest, Hungary with plenipotentiary powers. He would play a major role in the deportation and death of countless Hungarian Jews. 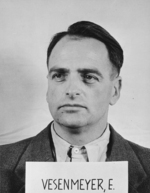 In 1949, he was found guilty of war crimes in the Ministries Trial and was given a 20-year prison sentence. In 1951, the sentence was reduced to 10 years, and by the end of the same year he would be freed. He passed away at a hospital in Darmstadt, Germany from heart failure in Dec 1977. 12 Nov 1904 Edmund Veesenmayer was born in Bad Kissingen, Germany. 19 Mar 1944 Edmund Veesenmayer was assigned to the German embassy in Budapest, Hungary with plenipotentiary powers. 16 Dec 1951 Edmund Veesenmayer was released from imprisonment. 22 Jul 1953 Edmund Veesenmayer's divorce with his wife Mary was made official in Hamburg, Germany. 24 Dec 1977 Edmund Veesenmayer passed away in Darmstadt, Germany. "IBM and The Holocaust" by Edwin Black, pages 254-266. It is unconscionable that he would be released after an insultingly short prison sentence. Something smells.